Guests are met and picked up at the hotel lobby by an El Sol Vida professional chauffeurs and transported in air conditioned comfort to Dunn's River Falls and Park. 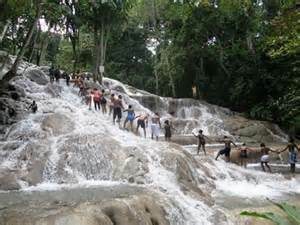 We encourage you to enjoy your escape in the garden parish of Ocho Rios, known and the Centerpiece of Jamaica and get your feet wet as you climb the famous 600 ft waterfall featured in the movies of Tom Cruise and James Bond. This exquisite landmark, The Dunn's River Falls, provides the perfect environment for fun and relaxation and is one of the island's most visited attraction. In addition to the falls, the location also has a beach for swimming and sunbathing, and a cafeteria that provides visitors with exceptional Jamaican cuisine. Each guest will receive a pre-purchased ticket to enter the location. Once inside the park guests are put into groups and assigned a trained guide who will conduct a brief safety and introductory session before the climb up the falls. The boardwalk along the falls provides easy access for those who do not wish to climb to photograph their love ones so nobody is left out of the fun. After the historic experience, have lunch at one of Jamaica's famous jerk centers and enjoy the Delicious chicken and pork along with a ice cold Red Stripe beer or tropical fruit drinks before returning to your Hotel or Cruise Ship. * Wear a water shoe or rent one with this activity. * Cameras are allowed just ask the guide to take care of it for you. * Use a bio-degradable sun screen lotion. * Take a little cash to purchase souvenirs and meals.